When building grinding systems, manufacturers need to ensure that the machines themselves are resilient enough to do the job long term. 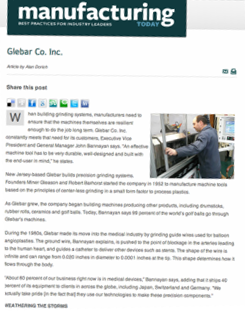 Glebar Co. Inc.constantly meets that need for its customers, Executive Vice President and General Manager John Bannayan says. “An effective machine tool has to be very durable, well-designed and built with the end-user in mind,” he states.